Vietnam and Egypt have issued a joint statement on the occasion of the State-level visit to Vietnam by President Joki Widodo and his spouse from September 11-12, made at the invitation of President Tran Dai Quang. 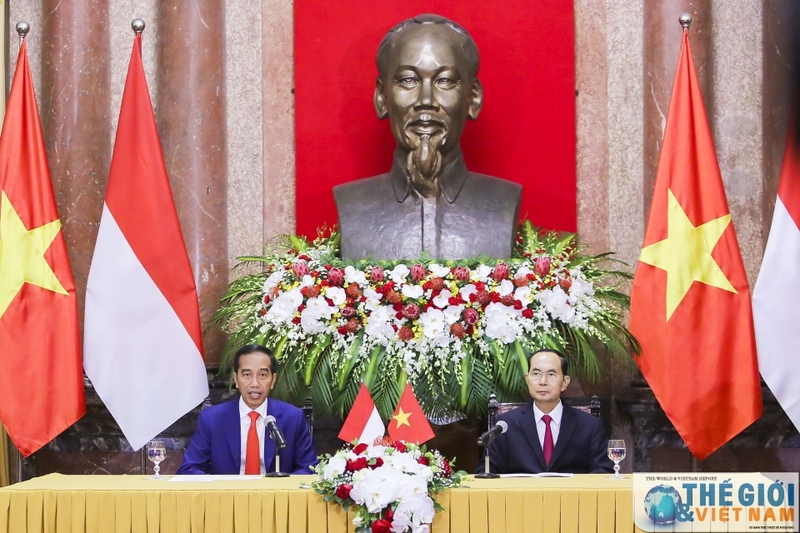 The Socialist Republic of Viet Nam and The Republic of Indonesia JOINT STATEMENT for Strengthening the Strategic Partnership (11 September 2018) At the invitation of His Excellency Tran Dai Quang, President of the Socialist Republic of Viet Nam, and Madam, His Excellency Joko Widodo, President of the Republic of Indonesia, and Madam paid a State Visit to Viet Nam from 11 to 12 September 2018. The visit underscored the closeness and the importance of the relations between the two neighbouring countries and strategic partners. During the visit, President Widodo was accorded an official welcome ceremony at the Presidential Palace and held bilateral talks with President Tran Dai Quang, who hosted a State banquet in President Widodo’s honour. President Widodo also called on His Excellency Nguyen Phu Trong, General Secretary of the Communist Party of Viet Nam and met His Excellency Nguyen Xuan Phuc, Prime Minister and Her Excellency Nguyen Thi Kim Ngan, Chairwoman of National Assembly of Viet Nam. President Tran Dai Quang and Indonesian President Joko Widodo. The Leaders had a wide-ranging discussion on bilateral, regional and international issues of mutual interest. The Leaders affirmed the long-term and time-tested friendship between the two countries, the foundation of which was laid by the late President Ho Chi Minh and President Soekarno, nurtured by successive generations of leaders and people of the two countries. The Leaders witnessed the signing of the Plan of Action for the Implementation of Strategic Partnership between the Republic of Indonesia and the Socialist Republic of Viet Nam (2019-2023) and the Joint Communiqué on Voluntary International Cooperation to Combat Illegal, Unreported and Unregulated (IUU) Fishing and to Promote Sustainable Fisheries Governance. The Leaders expressed their satisfaction with the excellent state of the Strategic Partnership, which is further deepened by strong mutual trust and extensive cooperation on all areas, among others are economic, defence, security, socio-cultural and people-to-people links. The Leaders agreed to maintain the current momentum of high-level exchanges and to create more opportunities to exchange views, ideas and initiatives on strategic issues through bilateral mechanisms and consultations, including the Joint Commission for Bilateral Cooperation (JCBC). The Leaders expressed satisfaction with the implementation of the first Plan of Action (2014-2018) and welcomed the signing of the Plan of Action for the Implementation of the Strategic Partnership between the Republic of Indonesia and the Socialist Republic of Viet Nam (2019-2023) on this occasion and underlined the importance of the full and effective implementation of this Plan of Action in laying foundation for substantive cooperation. The Leaders commended the progress in the negotiations on the delimitation of the Exclusive Economic Zone between the two countries and further agreed to task the Technical Meeting to accelerate the negotiation for an early agreement based on international law, particularly the 1982 UNCLOS. The Leaders acknowledged the significant progress made in defence cooperation, especially through the implementation of the 2010 MOU on Strengthening of Cooperation between Defence Officials and Its Related Activities and the Joint Vision Statement between the Ministry of National Defence of the Socialist Republic of Viet Nam and the Ministry of Defence of the Republic of Indonesia on Defence Activities Cooperation towards 2017-2022. The Leaders determined to explore further cooperation in the field of science and technology for defence industry. The Leaders reaffirmed the importance of enhanced cooperation to combat transnational organized crimes such as illicit drug trafficking, people smuggling, terrorism, cyber-crime, and money laundering. The Leaders expressed determination to expedite the consideration of an agreement on the prevention of trafficking in persons. The Leaders reaffirmed their commitment to strengthen close and effective coordination to protect each country’s national security interests. The Leaders agreed to intensify judicial assistance cooperation, particularly within the framework of the 2017 MOU on Legal and Justice Cooperation, including experience exchange on law enforcement, administrative reform, anti-corruption, etc. The Leaders encouraged the implementation of the 2010 MoU between the National Assembly of the Socialist Republic of Viet Nam and the House of Representatives of the Republic of Indonesia and welcomed the establishment of the Viet Nam - Indonesia Parliamentary Friendship Group to strengthen cooperation between the two sides. The Leaders reaffirmed their determination in promoting a strong, balanced and sustainable two-way trade volume, striving forwards the target of USD 10 billion as soon as possible, building on the platform created by the ASEAN Economic Community and an open, stable and conducive business environment of the region. The Leaders agreed to have stronger measures to facilitate and promote bilateral trade, including removal of unnecessary trade barriers and measures which are inconsistent with international and regional trade rules and norms, providing broader market access for two countries’ goods and services. Considering the development of economic cooperation, the Leaders agreed to task the relevant ministries to conduct a review on the 1990 Agreement between the Government of the Socialist Republic of Viet Nam and the Government of the Republic of Indonesia on Economic, Scientific and Technical Cooperation. The Leaders encouraged greater two-way investment. The two leaders welcomed and supported increasing bilateral investment in infrastructure development, manufacturing, agriculture, services, tourism, information technology, health, transportation, construction and logistics. The Leaders further agreed to ensure a conducive trade and investment climate through consistent implementation of national policies and regulations and tasked the relevant ministries to find solutions for the obstacles faced by the business people. The Leaders agreed to further promote cooperation on energy sector and encouraged active participation of state-owned and private enterprises from both countries in particular in the oil and gas exploration and production, refinery industry and services. The Leaders pledged to work actively to implement the 2013 MoU on Agricultural Commodities Cooperation, including the early convening of the first meeting of the Working Group on Agricultural Cooperation. They reiterated the shared commitment in encouraging and facilitating smart production of agricultural commodities. The Leaders agreed to increase the air and sea connectivity of the two countries to ease the movement of goods and people. Indonesia took note of Viet Nam’s request for the exchange of experience in inland waterway transportation. To cope with the challenges of the industrial revolution 4.0, the Leaders agreed to promote innovation through enhancing joint research, capacity building on Intellectual Property (IP), and technical assistance and training of IP professionals. The Leaders agreed to further enhance cooperation in rural development through the implementation of the 2017 MoU on Rural Development and Cooperation, strengthen cooperation on rural flagship products to improve rural economic productivity, on rural community empowerment to promote self-reliant village, on sharing of best practices in rural development and appropriate technology, and on training and assistance of rural development. The Leaders agreed to enhance maritime cooperation, by prioritizing sustainable maritime economy and marine resources, marine investment schemes, marine scientific research and development related capacity building activities and environmental sustainability. The Leaders welcomed the signing of the Joint Communiqué on Voluntary International Cooperation to Combat Illegal, Unreported and Unregulated (IUU) Fishing and to Promote Sustainable Fisheries Governance and instructed the relevant Ministers for the full implementation of the Joint Communiqué. The Leaders commended the commitments on maritime cooperation stipulated in the Agreed Minutes of the 3rd JCBC and instructed the Ministers to accelerate the implementation of the commitments therein. The Leaders agreed to continue implementing the 2017 MOU on Education Cooperation and to expand cooperation in education and training through, among others, exchanges of teachers and students. Sharing the view of the importance of human resources development, the Leaders agreed to task relevant agencies to develop direct link between vocational institutions and industries in the two countries to ensure the readiness of human resources to support the development in the industrial sector. Recognizing the importance of encouraging greater people-to-people links, especially among the youth, the Leaders tasked the relevant Ministries to increase activities including through youth exchange. The Leaders affirmed their commitment in facilitating the promotion of each other’s image through journalist visit program, exhibitions and expanded tourism cooperation. The Leaders acknowledged and encouraged further contribution of the Viet Nam - Indonesia Friendship Association and Indonesia - Viet Nam Friendship Association to enhance the relations between private sectors as well as people of the two countries. The Leaders shared convergence of views on various regional and international issues. They agreed to continue to work closely to address global and regional challenges, including transnational crimes, climate change, natural disaster risks, food - water - energy security nexus, among others. The Leaders noted with satisfaction the excellent cooperation between both countries in regional and international fora, such as ASEAN and ASEAN related mechanisms, APEC, ASEM, WTO, the UN and agreed to continue this tradition. Indonesia thanked Viet Nam for the latter’s support for Indonesia’s candidature as Non-Permanent Member of the UN Security Council (UNSC) for the term 2019-2020 and expressed its support for Viet Nam’s candidature on this position for the term 2020-2021. The Leaders reiterated their determination on maintaining ASEAN centrality and unity as well as ensuring the full and effective implementation of the ASEAN Community Vision 2025. They emphasised their support for an ASEAN-centric regional architecture, which is open, transparent, inclusive and rules-based. The Leaders reaffirmed the commitment to a rules-based multilateral trading system and also an early and successful conclusion of the negotiations for the Regional Comprehensive Economic Partnership (RCEP) with balanced and mutually beneficial outcomes, which would allow economies of different levels of development to actively participate in and benefit from an open and inclusive regional economic integration. The Leaders underlined the importance of maintaining peace, stability and the rule of law in the region, which includes the safety, security and freedom of navigation in and overflight above the region, including in the South China Sea. In this regard, the Leaders reiterated their commitment in, and support for the resolution of all disputes by peaceful means, without resorting to the threat or use of force, in accordance with international law, including the 1982 UNCLOS, with full respect for legal and diplomatic processes. Both sides emphasized the importance of non-militarization, the exercise of self-restraint in the conduct of activities that may raise tensions or escalate the disputes, and further adherence to universally recognized principles of international law and norms. Both sides reaffirmed their support for the full and effective implementation of the Declaration of the Conduct of Parties in the South China Sea (DOC) and welcomed the continued improving cooperation between ASEAN and China and were encouraged by the progress of the substantive negotiation towards an effective and substantive Code of Conduct in the South China Sea (COC). The Leaders exchanged views on an Indo-Pacific concept which enables ASEAN to continue its role as a primary driving force in the wider regional architecture. Indonesia expressed its appreciation towards Viet Nam’s support on the initiative to develop an ASEAN Indo-Pacific concept, which embraces key principles such as ASEAN centrality, openness, transparency, inclusivity, and respect for international law, while contributing to mutual trust, mutual respect and mutual benefit. The Leaders expressed satisfaction at the open and candid discussion in the spirit of mutual understanding, as well as at the significant outcomes of the visit. President Joko Widodo highly appreciated the warm hospitality and courtesies extended to the Indonesian delegation by the State and the people of Viet Nam during the visit and cordially invited President Tran Dai Quang to visit Indonesia at a mutually convenient time. President Tran Dai Quang took the invitation with pleasure.